One of the sets that I made, sizes 0, 1.5, 2, 2.5, 3, 4, and 6. I couldn’t find rods for sizes 1 or 5. All neatly lined up in a cute case. 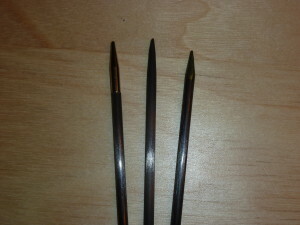 I love carbon fiber knitting needles, especially as double pointed needles. For me, and this is personal preference, I need a lot of control over stitches when knitting in the round with double points. Your hands are only on two of the four needles at a time and if you only have a couple of stitches on the needle, a metal or slick needle slips and slides a lot. This causes me to drop stitches. So I like the feel and control bamboo or birch needles give. However, birch needles are expensive and fragile, and though bamboo on Ebay from China are inexpensive, they break easily. My knitting goes with me almost everywhere and I have two toddlers and an eight year old so the accidents they have near my knitting has lost me more than one needle. 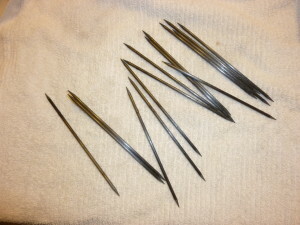 This is why I LOVE carbon fiber needles, they have the feel, warmth and control of wood and are nearly indestructible. With lots of use they seem to polish on their own. However, they are expensive. 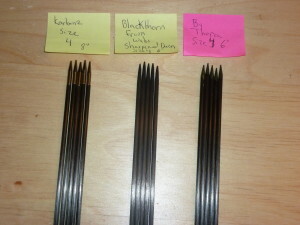 Blackthorn- These are wonderful needles, and almost everyone who owns them loves them, but at $35 for five needles, a complete set is more than I can spend on needles. 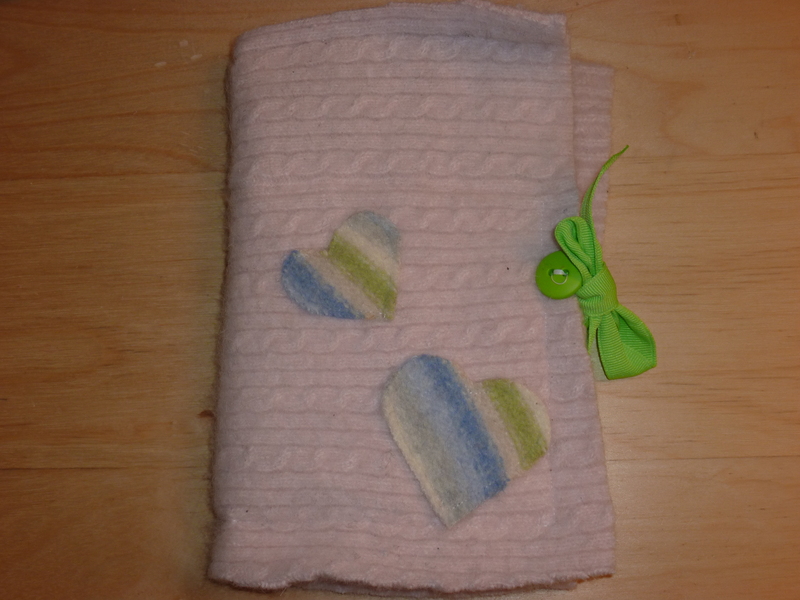 Knitter’s Pride Karbonz- These are more affordable, come in 6″ and 8″ length, and are about $15 to $17 for five needles. However, they have a metal point covering the tip. No matter the quality and how even the joins are, having a crevasse can cause the yarn to snag. It turns out that model airplane builders use carbon fiber rods to build their planes. These come in various diameters and with the instructions below can be turned into affordable knitting needles. 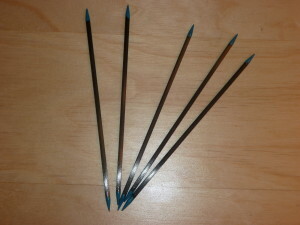 I found the knitting needles from China are either already highly polished or covered in a resin that makes them almost identical to the shafts of Karbonz needles so you do not need to sand the shafts. The two companies I ordered from in the US had rougher rods and you will need to sand the shafts. One of the companies, APC, had a section of the rod where the fibers kept pealing off. I ended up having to discard one needle. 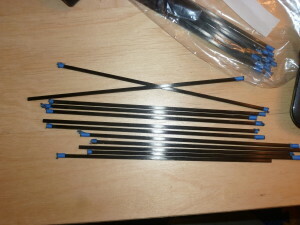 From CTS and Ebay I had no flawed rods. I hear hobby stores carry these rods, so you might be able to get the quantity need for just one set and inspect them for obvious flaws like I had (just one rode, so it might have been a fluke). When buying from China I got enough for three sets of 6′ needles, five needles per set. It might be a good idea to have a few people get together to share the cost and the work, or make the other sets as gifts. I was not able to find rods for US size 1 or 5. Carbon fibers are hazardous and a skin irritant. You want to make sure you are containing the fibers, wearing protective gear like a mask, safety goggles and gloves. If using bare hands when wet sanding remove rings. I got a few fibers caught under my rings and that itched and made my skin all gross, even months later the fibers are still working their way out. Wet the rods during sanding to keep dust from flying up and wash them several times during the process to remove the fibers. Just taking them out of packaging got little fibers all over my floor and clothes that pricked me. Right after you bring the rods home or open them up remove your rings and wash them off. If the rough kind of rod sand lightly to get all stray fibers off. Open the package outside and wash there or in a tub to keep the fibers contained. Wash your hands after to get any stray fibers off. 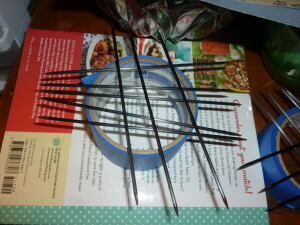 Dry the rods and then use little strips of blue tape to measure your needle lengths. Typical lengths are 5″, 6″, 7″, 8″ or 10″. You should have at least four needles of each size, but five is preferred. Using the rotary drill attachment for the larger sizes (US size 3 and up) and/or the cutters (for size 2.5 and smaller this works well) cut each needle. Store them in a way so stray fibers don’t shed over important places. I put them in zip lock bags marked by size. Wash them off, and then remove the tape. Using your old fashioned pencil sharpener sharpen each end of the needle. 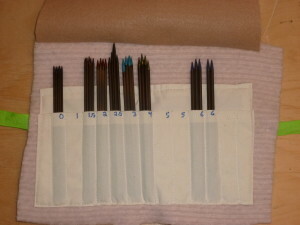 In the photos above you can compare the needle tips for the kind of needles. The sharpener makes a really sharp point. 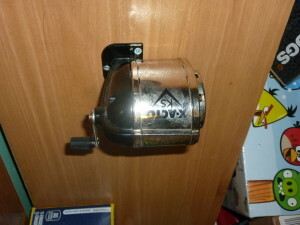 Put a damp cloth/rag under the sharpener to catch stray fibers and empty sharpener after completed. Wash the needles again, and if the shinny kind of shaft wet sand JUST the tip with 220 and then 320 sandpaper. I sand them in a sink full of water. If the rough kind, sand the whole needle, the tip and the shaft, sanding in direction of the the fibers (length wise). Wash and dry the needles. The tips I had were not perfectly smooth and still snagged the yarn. I used nail polish to make the tips really smooth. These may wear away beautifully with time (left only in the crevasses that caused the snag), or wear away and need to be replaced. Since I am making a whole set, each needle size has a bottom coat of a different color of nail polish to help tell the different needles apart. Then finish with a top coat of clear coat (get a good quality brand/kind so it lasts). I balanced them on rolls of tape so that I can keep the tips off of the table and be able to paint each end at a time.